Broken Bootlegs is a weekly series covering unlicensed games (also known as bootleg games) for mainly 8-bit and 16-bit consoles. This week’s entry brings one of the more well-known fighting game series to the Sega Genesis/MegaDrive: King of Fighters! While on a neverending quest to find fighting games to play some years back, I eventually started exploring outside of the realm of Capcom and rediscovered SNK since I played Samurai Showdown IV back when it was new. From Art of Fighting, to Fatal Fury, to King of Fighters, I fell in love with the older KOF games, with ’98 being one of my favorites from that group. As I didn’t have regular access to arcade hardware, I looked to seeing what ports were out there at the time, and my only options were to get it for the PS1 or Dreamcast, neither of which I had about a decade ago. Low and behold, I found three games for the Sega Genesis- King of Fighters ’98, King of Fighters ’99, and King of Fighters 2000. While they’re bootlegs, they provide an interesting take on the King of Fighters series as a whole. 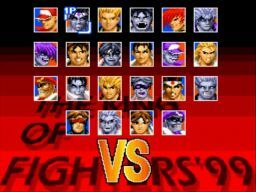 As evidenced by the less than stellar title screens for each of the games, the premise of the games are similar to the source material in that there’s 3-on-3 fights with a number of fighters from King of Fighters though some of their respective stages, along with their “dark/evil” counterparts, and all the fighters have special moves that can be performed. The deviations from there are either from design choice, or due to hardware’s limitations. Possibly the most glaring examples of liberal design choice out of these three games is with King of Fighters 2000: it’s just a title screen hack of ’98! One other notable deviations is music that’s taken from yet another unlicensed game for the same system, Mighty Morphin Power Rangers – The Fighting Edition. In addition to that, there’s not just music from the Street Fighter series, but there’s a few characters to boot, like Ryu and Cammie. Rounding out the roster are a few Art of Fighting characters with “dark” versions to boot. The control scheme is quite simplified, leaving buttons to block, punch, and kick, respectively. Controls for the game are somewhat decent, but with characters being a bit floaty and special attacks being limited due to the button setup, it leaves something to be desired. Playing though the mostly-cheap AI opponents only gives a Congradulation screen at the very end, which is not surprising at all for a bootleg game. Humorously enough, just like many other bootleg fighting games that are out there, character names are quite Engrish, like Teery for Terry and Takum for Takuma. Unsurprisingly, the Engrish continues on with King of Fighters ’99. One of the more notable entries is Cycl, which is Cyclops taken from a SNES/SFC X-Men vs Street Fighter bootleg. While I’d love to touch more on the SNES Fighting Engine and the games that used it, that will be for a future Broken Bootlegs. 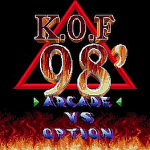 That said, KOF ’99 is a bit of an alteration with redesigned stages, a slight roster change, and music more than likely taken from other games, it’s more of the same from the previous game. It’s kind of ironic since that’s how a lot of official yearly game series are. The two games are separate enough to where it’s somewhat interesting and can provide some replay value in their own respects, at least. Either game would be a decent addition to any bootleg game collection, and doubly so for any fighting games fan.